Mitki: The Soviet-era youth movement that loathed David Bowie. How David Bowie became the loathed adversary of a Soviet-era youth movement. 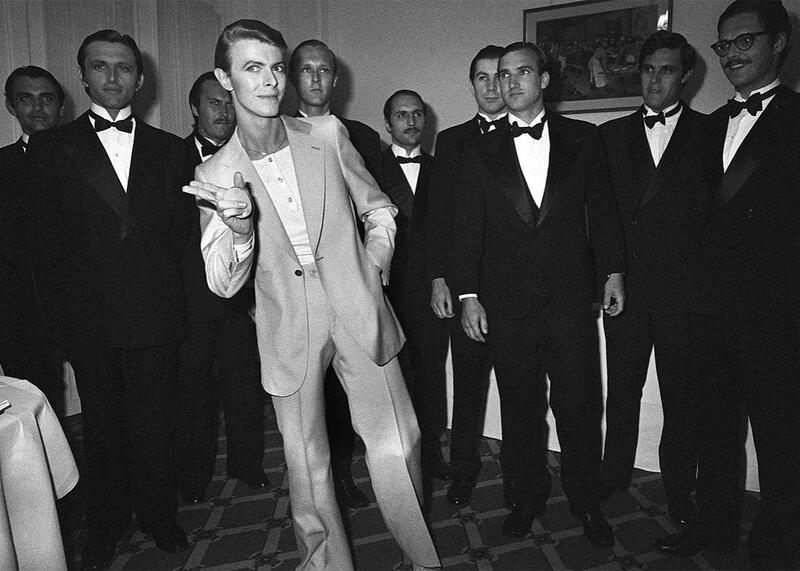 David Bowie poses during the 31st Cannes Film Festival on May 30, 1978. David Bowie, who died on Jan. 10, played many roles in his long career, from Ziggy Stardust and the Thin White Duke to cameos as far-flung as voicing a character on SpongeBob SquarePants to a fleeting appearance on David Lynch’s Twin Peaks. Bowie’s charisma and presence allowed him to shift with apparent effortlessness from character to character. One of the most outlandish roles of his career, however, was a part that he didn’t choose: Among a certain set of Soviet citizens, Bowie became notorious as the immaculately fashionable foe of the artists collective and aspiring youth-movement masterminds known as Mitki. Bowie had visited the USSR twice during the 1970s and was photographed riding the Trans-Siberian Railway and visiting iconic landmarks, including Moscow’s Cathedral of St. Basil the Blessed. However, Bowie’s music was entirely banned in the Soviet Union. Strict media restrictions prohibited a vast swath of “foreign-influenced” popular music, from Russian-language rock groups like Kino and AuktYon to global hit-makers like AC/DC and the Talking Heads. These censorship policies kept Bowie from performing publicly during his ’70s visits and kept his recordings off the shelves. However, in cities like St. Petersburg—then Leningrad—those in the know could find cassette tapes of his albums with relative ease through the shadowy network of do-it-yourself transcribers known as samizdat. September 1982 found Bowie at a pivotal moment in his career. A predatory contract with an unscrupulous manager was set to expire at the end of the month, freeing the singer to choose between a number of lucrative new recording offers. That same September, as Bowie anticipated a windfall on the other side of the globe, a young artist named Vladimir Shinkarev eked out a meager living as an attendant in a coal-powered boiler room in Leningrad. Toiling in the obscurity of officially sanctioned Soviet work had its advantages, however: He and others of his generation took advantage of ample time off to pursue outside interests. In Shinkarev’s case, these included painting, writing, and bonding with friends over copious bottles of cheap port wine. On Sept. 24, Shinkarev began work on a series of tongue-in-cheek pamphlets that distilled the aesthetic of his peers into the manifesto of a youth movement. This movement was intended to parallel Western subcultures such as punk but with a proudly Russian twist. Dmitri Shagin is described in the pamphlet as not only the group’s figurehead, but also its most typical member. A painter and drinking companion of Shinkarev’s with a tendency to gently defy social convention by, say, shaking hands with women and kissing men on the cheek, Shagin embodied the absurdist quality of the movement. He professed a deep love for both the Imperial Russian and Soviet military, especially a fascination with all things naval, while simultaneously strictly rejecting violence in all forms. Thus, the Mitki were born. Released in installments via the same samizdat system that circulated Bowie’s work, the Mitki texts found a receptive audience, first among Leningrad youth, then ballooning outward through much of the Russian-speaking world. Key features of the hypothetical ideal Mitki adherent were the blue-and-white striped tel’niashka shirts typical of Russian sailors coupled with a pacifistic desire to “not defeat anyone.” As for the name, Shinkarev explained that, very simply, it’s easy to type: The Cyrillic letters that make up the word Mitki lie immediately next to each other on the bottom row of the Russian keyboard. The group, based in St. Petersburg with a secondary branch in Moscow, functioned as a loosely knit collective of largely apolitical underground artists and their supporters, hosting unofficial exhibitions and concerts until perestroika allowed them to emerge from hiding in the late ’80s. Given the humble boiler room beginnings of the Mitki movement, it’s not surprising that overarching rejection of Western glamor is a central tenet of the group’s idiosyncratic philosophy. Exactly how Bowie was chosen as the principal representative of this glamor is a more complicated question. Bowie’s Thin White Duke–era flirtation with fascism—in 1975, he told an interviewer he believed “very strongly in fascism” and called Adolf Hitler “one of the first rock stars,” though he later expressed regret for the comments—may have provoked the ire of the Mitki. A group fixated on Russian military endeavors, including, of course, the costly Soviet victory in World War II, could hardly be expected to approve of a Nazi sympathizer. Perhaps the Mitki were also aware of Bowie’s exceedingly dandyish photo shoot in Moscow and disapproved of the juxtaposition of his rocker’s preening in front of Russian landmarks. Another possibility lies in the similarities between Bowie and the Russian rock musician—and Mitki compatriot—Boris Grebenshikov. As a young man, Grebenshikov resembled and sometimes dressed similarly to the tall, thin superstar; it’s possible that Shinkarev cast Bowie as villain in order to subtly poke fun at his friend. One thing is for sure: When the Mitki decided upon Bowie as antagonist, they fixated on him mercilessly. Shinkarev describes Bowie as the absolute antithesis of the Mitki style of dress. A true Mitki man, by his description, should be so intrinsically unfashionable that “he could wear a costume in the style of David Bowie as if it were an old torn coat.” At a later point in the Mitki series, Shinkarev tells the story of an American, a Frenchman, and a Mitki Russian, all of whom try and fail to save a drowning woman who has fallen off the side of a ship. Shinkarev says that when the American and the Frenchman enter the tale, a Mitki man should shout words to the effect of “All in all, that David Bowie! What a jerk!” For the Mitki, Bowie served as whipping boy for the sins of all proud Westerners. Alexandar Mihailovic, a professor of Slavic studies at Brown University, recounts an alternative version of the “Woman Overboard” story, with a new ending provided by Mitki spokesman Dmitri Shagin. In this variant, the antagonist—Bowie—goes forth to save the woman in a boat equipped with technological gadgets. His gear fails and he cannot save her, but the Mitki man is able to miraculously rescue both Bowie and the woman by walking on water. He comforts Bowie by referring to him by an overwrought diminutive name: Devidushka Bauyushka. A drawing by Mitki member Aleksandr Florensky references the aforementioned treatise. Made to look like a book jacket, it features Bowie in a face-off with a typical Mitki adherent and is entitled The Fundamental Work ‘The Mitki and David Bowie,’ with the unhelpful subtitle, “The Fundamental Work ‘The Mitki and David Bowie’ Has Not Yet Been Written.” Bowie is depicted as clean-shaven and spiky haired, with a pair of headphones that betrays his reliance on technology, which the Mitki professed to scorn. Followers of the Mitki movement were obliged to flamboyantly, demonstratively resent David Bowie. It’s not clear that this resentment was rooted in actual dislike, however. The Mitki were engaging in a brand of Russian humor known as stiob: parody so deep that it can be impossible to tell sincerity from insincerity. Bowie as antagonist became a tongue-in-cheek trope, one of many such tropes that group members were intended to repeat ad nauseam as a way of strengthening collective Mitki identity. By the late ’80s, the Mitki name had enough traction to make the core collective fairly well-known and successful in their native region. However, high-profile rock concerts and meetings with celebrities and political figures strained the ties between the movement’s founders. Shinkarev did not appreciate the increased mainstream visibility and made his feelings clear in 2010 with a book entitled End of the Mitki. Shagin, however, continues on today under the Mitki name with a modified version of the original contingent of artists. Ultimately, the Mitki fascination with Bowie has its roots in admiration. The unity of purpose of international counterculture proved strong enough to overcome differences in dress and political context. The Mitki representation of Bowie, as thoroughly fictive as it may be, is not too far from the effect the real Bowie could have on a listener: Bowie’s radical otherness could be alienating, but it could also blur boundaries.